Seminars for your organization, banquet, corporation or event are offered by professional speaker Timothy Flanigan. Each program is educational, entertaining and utilizes Tim's award winning photography. Make contact for further information, dates of availability and prices. Click or navigate to the Contact Page and type 'Seminars' in a subject line. Exceptional photography combined with highly informative narration makes The Whitetail Deer a must see program for hunters and non-hunters alike. Tim Flanigan draws upon decades of experience as a hunter, photographer and wildlife conservation professional to deliver extensive and insightful information about the world of the whitetail deer that will inspire greater appreciation of this amazing animal and increase hunters odds of success afield. 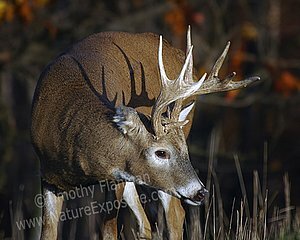 All aspects of the deer's life history; from diet and body functions, to specific anatomy and reproduction are addressed. Deer research and management principals are also explained. 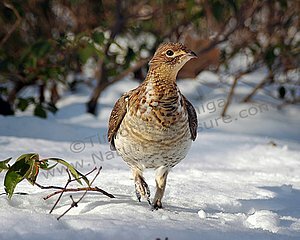 The undisputed King of Game Birds, the Ruffed Grouse is honored via Tim Flanigan's exceptional photography and extensive knowledge of this truly amazing and intrinsically wild native bird. Decades of study, research, hunting, photography and professional wildlife conservation experience have given him a wealth of grouse knowledge that he enjoys sharing with the audience. This in depth presentation explains reproduction, heart rates, feather functions, body temperature, feeding habits, and daily activities of the Ruffed Grouse. Viewers will gain a deep appreciation for this unique game bird and hunters can apply the imparted grouse knowledge to increase success afield. Regarded as an expert, Tim's award winning writings and photography of grouse are commonly published in various national sporting magazines and books. Photography is the art of capturing light to preserve unique moments in time that can be shared with and appreciated by others. Viewers of this highly-informative program will learn to create photography rather than simply taking snap shots. Via photographic images and insightful narration, Tim Flangian encourages the audience to see and compose photographs in their minds and then capture those images with photographic equipment. Great photography is possible by everyone, no matter how high-tech and expensive or how simple the photography equipment used. The key to success is learning to see and evaluate the quality of light. From proper light catching techniques, composition and exposure to equipment and printing, all aspects of modern still photography are explained in easy to understand language and illustrated with Tim's award winning photography. The wealth of effective photographic tips will suit all audiences who enjoy capturing memories and sharing them with others. 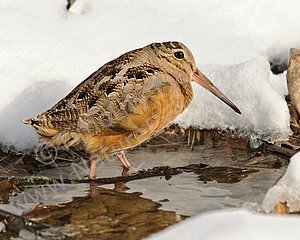 This program is highly informative about this fascinating little bird, also known as the timberdoodle. The migratory woodcock has captured the hearts of wingshooters worldwide and Tim Flanigan's narration imparts in-depth natural history and utilizes his award winning images. The audience will leave with a greater appreciation for the timberdoodle, their habitat needs, wingshooting tips culminated from years of experience, dog handling advice and how to use this knowledge to hunt the American Woodcock successfully. Tim's lifelong passion for this amazing bird has produced a program on the woodcock that has been reviewed as "the finest seminar ever heard, on any subject." Much more than the exceptional natural beauty of our native wildflowers is depicted and celebrated in this photographic presentation of award winning images that are certain to delight the eye and warm the soul. Tim Flanigan's personal narration draws upon decades of research and experience afield to offer viewers in depth information regarding the plant's natural history, medicinal and dietary uses, Indian lore, value to wildlife, growing locations and blooming periods. This program imparts a wealth of natural world knowledge that will inspire a deeper appreciation of, as well as a personal commitment to natural resource stewardship.